I grew up eating my goulash made by my grandparents so I am looking forward to this homey food found in Prague. And dumplings! Yum! But, I have read in several places to skip the local wine (unless it is a Riesling or a sweet Moravian Muscat) and to drink beer instead…which I also probably wont like. Drink suggestions for Prague? 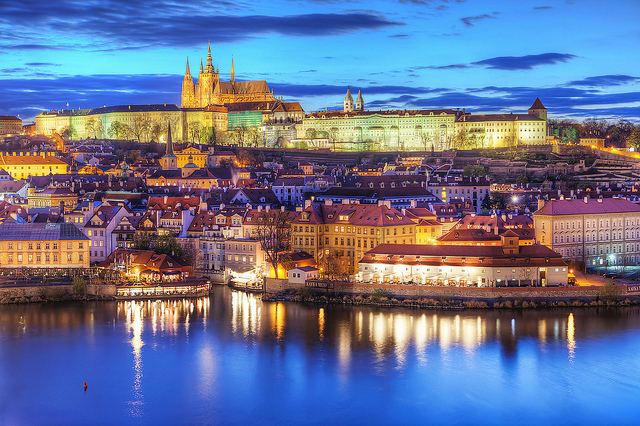 I have three nights in Prague to eat and drink as much as I can; what should I consume? As usual, I prefer to have a breakfast in the hostel, a snack while out and about, and a late lunch/early dinner. Snack: One of the first snacks I saw mentioned on various lists looks a lot like a doughnut- the kolač. The Business Insider article says that they can be filled with, “pastry filled with poppy seeds, fruit jams, nuts or sweet cheese”. Lunch: Jewel Cafe Bar is in old town, said to have great drinks, and they serve wild boar and duck! Also, it has tapas! Who doesn’t like tapas?! Dinner: I don’t know if I mentioned it before, but I love goulash and dumplings. I grew up with my mother’s homemade dumplings and I’m expecting this place to measure up! One place I’ve read about that has supposedly good dumplings and goulash is U Kroka. Snack: People say that smažený sýr are like mozzarella sticks on steroids. Yum. It is supposed to be a street food that you can easily find anywhere. Anyone have a favorite corner stand to recommend? Lunch: Restaurant Rainer Maria Rilke is supposed to have great old school Czech food. The smoked pork and crispy duck sound great here. Dinner: Pastar restaurant is marketed as an Italian/International/Mediterranean place with an attached shop and everything on their menu sounds great. Snack: I love a good crepe, and that is exactly what the palačinky sounds like. Cafe Creperie Pod Vezi is a popular place for crepes, but I have heard that they can be found everywhere. Lunch: With such a meaty dinner planned for later, a smaller lunch of a simple Czech sausage might be perfect. This page says that the Pikantní Klobásy is a spicier sausage easily found on many street corners. Dinner: I don’t generally like to feel like a caveman while I’m eating my dinner, but I have a feeling that it might be unavoidable if I try to popular Czech koleno (roasted pork knee). U Mlynare is said to have good pork knee. The wine in Prague is really good – there’s a vineyard right next to the castle with a terrace where you can sample the local stuff by the glass. If recommend it, or the Budvar beer on tap anywhere.